The stubborn, fearless, flying boy who never wants to grow up. 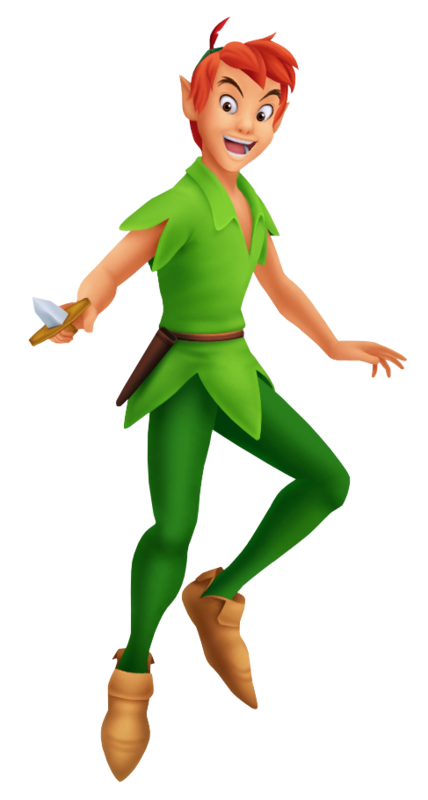 Nevertheless, Peter has a kind heart and he helped Sora and friends during their adventures in Neverland. The trio got off on the wrong foot when they first met Peter after being thrown into the hold of Captain Hook's ship. The quickly made amends and agreed to help each other in saving Wendy and Kairi, with the assistance of Tinker Bell, Peter's fairy friend. He sprinkled Sora, Donald, and Goofy with pixie dust giving them the ability to fly. After rescuing Wendy and taking her somewhere safe, he returns to save Tinker Bell who was taken hostage and to aid Sora in fighting against his long-time enemy, Captain Hook. After the battle, Peter invites Sora to bring Kairi to Neverland in the future so that she can try flying herself. Tink finds the Keyhole at the clock tower and Sora seals it with the Keyblade. Peter says goodbye to Wendy, but reassures her that they can see each other any time as long as she remembers Neverland. Seeing the two holding hands makes Tinker Bell jealous again. Peter asks Sora to look after her and Sora learns to summon Tink. Peter later helped Sora to defeat the Heartless, Phantom, that had taken over the clock tower. 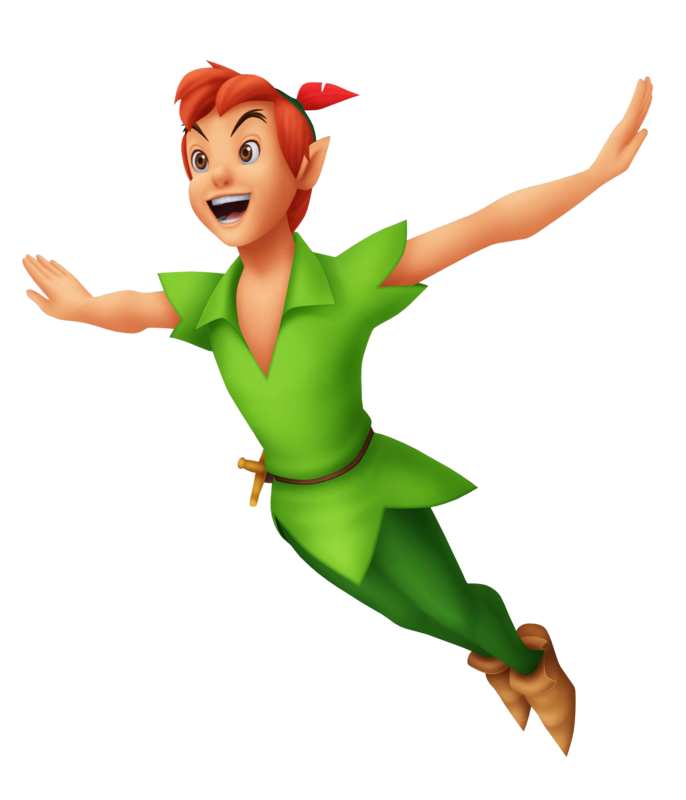 The legendary boy hero who never grows up, Peter Pan continues to be an ally long after Sora leaves Neverland. He grants Sora flying abilities and gathers enemies together for an easy battle, stabbing enemies rapidly at the same time. His willingness to leave his world and fight alongside Sora is a callback to their adventures together a year previously. Peter Pan, the boy who will never grow up, also the leader of the Lost Boys. Peter Pan spends time in Neverland exploring, causing mischief, and tormenting his arch nemesis Captain Hook, of whom he stole the hand of and fed to the Crocodile. He can be very childish but also very compassionate and knows a lot more than he lets on. In Birth by Sleep, Peter Pan crosses paths with Terra, and the two end up fighting after Captain Hook tricked Terra into thinking Peter Pan was after his treasure. The two end up figuring out the trick before either is seriously injured. He then saves the Lost Boys and Peter from a swarm of Unversed before leaving. Peter then runs into Ven after Ven takes down Captain Hook. He tells Ven that the real treasure are those item which are cherished most. Ven then leaves his Wooden Keyblade inside the otherwise empty treasure chest so that they may remember him. When Aqua comes to Neverland Peter makes Aqua their leader to find the treasure, which Captain Hook has stolen again. When Aqua and the boys recover the treasure, Aqua spots Ven's Wooden Keyblade and Peter tells Aqua about Ven and his doings at Neverland.